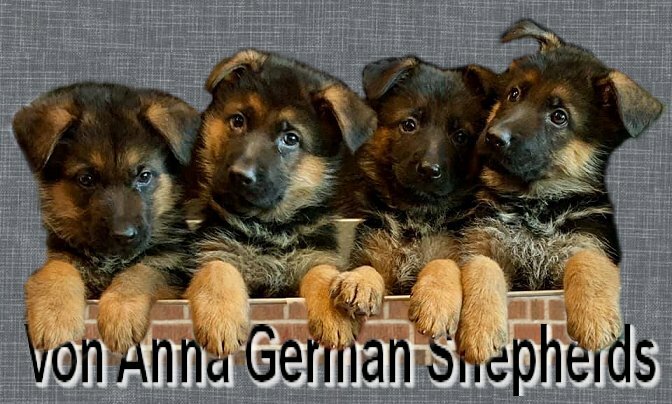 Shanette and Glen McIntosh started Von Anna German Shepherds, LLC, our high quality pedigree German Shepherd puppy breeding program out of love for our German Shepherd “Anna”. We are a German Shepherd Breeder with spectacular Show Bred Females and Males that rival the top German Shepherd Breeders in the country, particularly the Southeast United States. We raise purebred AKC German Shepherd Puppies exclusively from imported Western Germany Champion Pedigree Dogs. We strive to improve the German Shepherd Dog breed in the US by importing Championship Bloodline German Shepherds from a careful study of great bloodlines in current Western Germany Show history. We started our German Shepherd breeding program with only the highest quality imported western Germany Champion parents. All of our Males and Females are titled show dogs and have generations of world champions in their pedigree or are first generation offspring of world championship dogs and/or in the process of earning their own titles. We strive to provide a breeding environment for the dogs in our family that is kind, humane, and provide an exciting, stimulating home for our dogs and their litters. We have a multiple acre lake front estate in North Georgia (near Cartersville Georgia) where the dogs can run free on beautiful land, enjoy boating with us, and live in our home. Show Bred German Shepherd Dogs? The German Show Quality Championship heritage assures the strictest adherence to German breeding standards, not diluted by poor genetics and with standards that far exceed the AKC standards. AKC and American bred dogs have no such controls at all and have a much greater potential for unstable dogs that are not safe around children, friends and neighbors. • The most beautiful Black and Red German Shepherd with brilliant red and jet black coats. • The best elbow and hip health potential due to generations of champions with healthy hips and elbows in our dogs pedigrees. • The greatest potential for a loving, well socialized family pet and a stable disposition Protection dog, show dog, or service dog. Western German Show-line dogs historically have generations of German Shepherds that achieved a V or VA title. These require a stable, good disposition to achieve and a KKL Korung breeding suitability rating. • Most of our clients buy puppies for family companion rather than show, however the show bred German Shepherd Puppy assures a Top Quality loving and beautiful dog..
Where Do We Excel ? 1. We are one of very few German Shepherd Breeders in the country who have adopted and practice the proven early puppy neural and social development program that encourages high aptitude puppies. Every one of our puppies gets loving socialization daily from birth and advanced development stimulation. As they grow, they are in the house with us with constant socialization, they visit childcare centers, schools, and nursing homes for further socialization and community service. We have acreage on a beautiful lake front setting where our dogs are free to run and enjoy life. Visit any other kennel and then come visit us. The happiness and loving nature of our dogs speaks for itself. 2. We boast multi-generation pedigrees of Champions that equal the best in the Country. 3. We genetically select the Sire and Dam for the best possible litter. While we have a spectacularly well pedigreed male, we often search around the country for a male with the pedigree that will best serve our litter with a particular female.